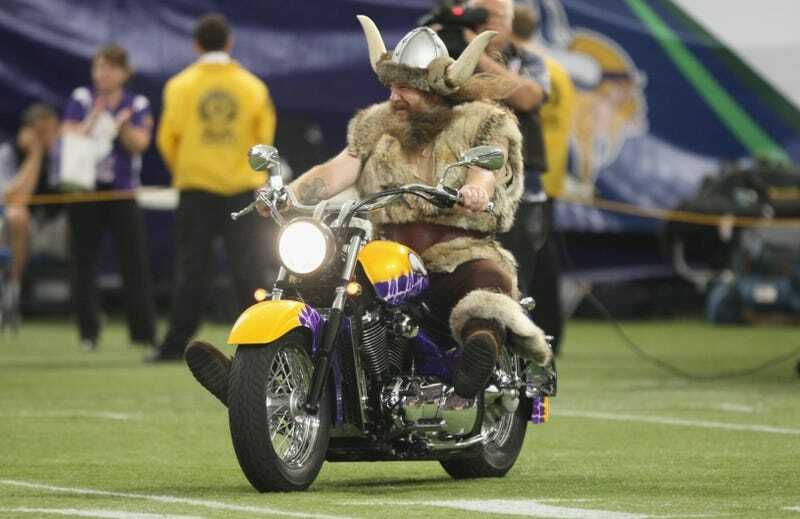 Fans noticed a distinct lack of of Ragnar, the biker viking mascot, at Minnesota’s first home game this weekend. That led the Vikings to issue a statement yesterday confirming that Ragnar, absent for the first time since 1993, isn’t there because the team can’t agree with him on how much loot and plunder he ought to get. Ragnar was asking for $20,000 per game over the next 10 years, a person with direct knowledge of the discussions told The Associated Press. That would be $1.6 million for eight regular season home games per season, and $2 million if preseason games were included. The person spoke on condition of anonymity because the team does not publicly discuss contract negotiations. That would be a big raise for Ragnar, who made about $1,500 a game last season. One would expect the two sides to come to a deal soon—if the Vikings could find common ground in contract negotiations with a child-beater, they shouldn’t have much trouble signing a guy who merely raped and pillaged and established the Danelaw. In the meantime Ragnar’s stuck watching at home, and god, that pelt must smell terrible by now.